From left: Gillian Murray, UNODC; Ambassador Erfani; Moderator Michael Platzer, ACUNS; Mr Farhad Darya; Ana Lukatella, OSCE; Veronika Eschbacher, Wiener Zeitung. Today, the Permanent Mission of Afghanistan co-hosted a colloquium regarding the role of art in the promotion of peace and development. 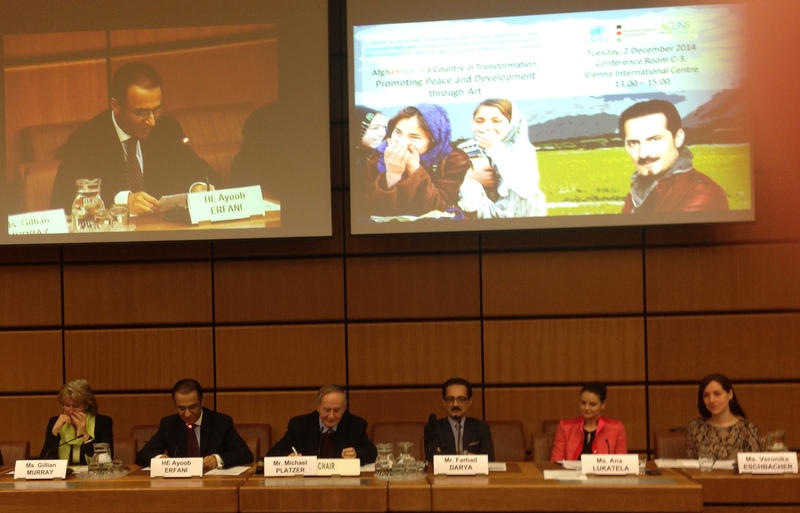 The event was jointly organized with UNODC and ACUNS and took place at the Vienna International Center. The event was very well attended by UN staff, diplomats and NGOs. “Today, we will highlight a beautiful side of Afghanistan: its rich culture and how it positively contributes to the development of the country, in the context of the stabilization and democratization efforts during our Decade of Transformation 2015-2024”, noted Ambassador Erfani. Ambassador Erfani’s statement was followed by the keynote speech by Mr. Darya. He talked about the fact that the media only focuses on negative news about Afghanistan. Positive aspects, such as music and art, play a crucial role in transformation by giving hope to the people and thus cannot be neglected. He stressed the importance of art in showing the world that war is not the only option for Afghanistan. After a second welcoming statement by ACUNS Vienna liaison officer Dr. Michael Platzer, panelist Ms. Ana Lukatela, an advisor on gender issues at the OSCE, took the floor. She emphasized the importance of art in the peace building process as well as access of both men and women to art and media. Ms. Lukatela was followed by Ms. Eschbacher, a journalist from the Wiener Zeitung, who has made many trips to Afghanistan and writes about political and social issues in the country. Ms. Eschbacher stressed the importance of art in post-conflict societies and called for a reevaluation of cultural traditions in Afghanistan. Finally Ms. Murray, Deputy Director of UNODC, thanked Mr. Darya for his efforts as a good will Ambassador for UNDP and UNODC. All panelists came up with insightful observations, remarks as well as questions for Mr. Darya. This was followed by a lively Q & A session, in which many in the audience participated. Both guests and panelists expressed their gratitude towards Mr. Darya for his great contribution in promoting peace and development in Afghanistan.